A new television show highlighting ocean and coastal scientists and cultural experts from Hawaii and the Pacific will debut on January 5, 2014. “Voice of the Sea” will be broadcast on on KVFE (Channel 5 and 1005) on Sundays at 6:00 p.m. The show is hosted by Dr. Kanesa Duncan Seraphin, world paddleboard champion, shark researcher, and science education expert. Dr. Seraphin, director of the University of Hawaii Sea Grant Center of Excellence in Marine Science Education and associate professor at the Curriculum Research & Development Group in the College of Education at the University of Hawaii at Mānoa, has traveled across the Pacific to bring stories of relevance to Hawaii. Each half-hour episode profiles local science and cultural celebrities and presents thought-provoking information in an exciting, original, reality-based way. People of all ages will be inspired by the real-life stories and experiences highlighted in each episode, and viewers will get a glimpse of how these remarkable individuals are making a positive impact on the future of Hawaii and islands throughout the Pacific. As a signature project of the UH Sea Grant’s Center for Marine Science Education, the Voice of the Sea aims to inspire an interest in ocean science, and teach concepts that apply to viewers’ own lives and their relationship with the ocean and planet. By enhancing viewers’ understanding of who these science and cultural experts are and what they do each and every day, Voice of the Sea will create a more engaged and vibrant community. In addition, an important goal of the show is to inspire students to pursue a career in Science, Technology, Engineering, and Mathematics (STEM) fields, and become the next generation of leaders in their community. 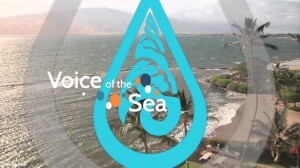 Voice of the Sea was developed by the Curriculum Research & Development Group and the UH Sea Grant Center for Marine Science Education, with funding from the National Oceanic and Atmospheric Administration Pacific Services Center. The UH Sea Grant Center of Excellence in Marine Science Education is dedicated to building partnerships that enhance marine science education at all levels (kindergarten through graduate school and the public community) in order to foster understanding of the natural world and the role of humans in it. The University of Hawaii Sea Grant College Program is part of the University of Hawaii at Mānoa’s prestigious School of Ocean and Earth Science and Technology. It supports an innovative program of research, education and extension services directed to the improved understanding and stewardship of coastal and marine resources of the state, region and nation. Science serving Hawaii and the Pacific for over 45 years.